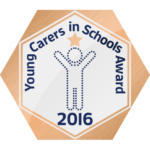 At Crofton Hammond Junior School we are aware that some of our pupils are young carers. A young carer is someone under 18 who is caring unpaid for a family member or friend who is ill, frail, disabled or has mental health or addiction problems. They often take on practical and/or emotional caring responsibilities that would normally be expected of an adult. Crofton Hammond Junior School endeavours to identify and offer the support that young carers need. Miss Millington (Deputy Head/SENCO) and Mrs Casey (TA) are the school’s Young Carer leads. To support young carers (YC) in our school community we offer a weekly lunchtime club named by the children as ‘Calm Situations’. On a Thursday morning and evening a work space is available to complete homework (Sunrise and Sunset Club). In addition children can have ELSA support, YC drop in sessions and families can seek support from our Family Liaison Officer Lisa Noice. Children are encouraged to look at the notice board outside the Group room for information regarding drop-ins, lunchtime club and upcoming events and support information. If you think your child is a young carer and would like any other information or support around these issues, please contact Miss Millington or Mrs Casey. We respect the privacy of our young carers so will only share information about them with people who need to know so that they can offer help.